Knaresborough Town had to settle for a 1-1 draw from their tempestuous derby meeting with Selby Town at Manse Lane. Town were once again left to rue their tendency to drop two points in close games, a trait that threatens to undermine their NCEL Division One play-off bid. That said, luck did not go their way. The match officials failed to spot visiting keeper Peter Lawrie carry the ball over the goalline in the 86th minute, an act that if spotted, would have handed the hosts a crucial lead. Paul Stansfield’s side began slowly as the game itself struggled to build up much of an early head of steam. Brad Walker fired a threatening cross across the face of goal that was hacked clear, before the winger squared up Dane Mortimer and had a penalty shout for handball turned down. A Walker delivery found the untracked run of defender Sam Cook, who turned slightly in the air to nod into the top left corner. After Jason Crisp fired a warning with a well-struck free-kick in first-half injury time, Stansfield’s team came out after the interval with real intent. Jonty Maullin was only just foiled by a defender after breaking from midfield and Walker continued to make a nuisance of himself, scuffing a shot wide of the right-hand upright when the ball broke loose. Paul Atkinson drifted a free-kick to the back post that Fraser Lancaster nearly got on the end of, while minutes later Atkinson couldn’t engineer an angle to shoot despite nicking in ahead of Lawrie to collect Dom Wilson’s through-ball. Selby had their own efforts on goal although home custodian Jack Rushworth was not unduly tested. The Town goalkeeper was at the centre of the action in the 80th minute, head-butting Wayne Brook to the ground after the two had a coming-together. Referee Michael Leneghan had no option but to send him off. Rushworth’s dismissal was to prove costly as just moments later Crisp curled a corner into the box and straight over the head of replacement stopper Dan Dekanski for 1-1. Four minutes from time a right-wing cross bounced in the box and Lawrie fielded it, but seemingly from a yard behind his goalline. The linesman was unmoved and Knaresborough were cruelly denied a second goal. They had a chance to right that wrong moments later but fluffed it, as Atkinson managed to athletically lift the ball over the crossbar from about three yards out. 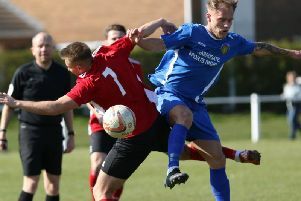 Town, who could have had their hands on a play-off spot with rivals Hallam losing, played at home for the first time in four games and will hope to revive the sort of form they had at Manse Lane before it declined in December. They are on the road next weekend, though, with a trip to Glasshoughton Welfare.